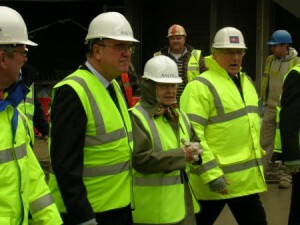 Club Vice-President Alan Erricker gives HRH a conducted tour around the new Ascot re-deveopment – but where is Mr Banks? New Milton have cried off the match on Saturday 18th March because of the number of players attending the England v Ireland game. So what was wrong with a 7.30 am KO? 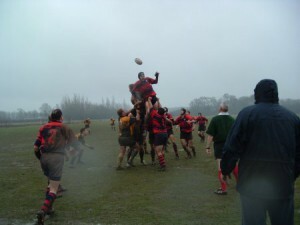 Verwood were back in League action on Saturday 11th March at home to Overton. Unfortunately, the game was abandoned following a neck injury to Verwood centre Lee Mayne after a few minutes into the second half when Verwood trailed 12-0. Lee was taken by ambulance to Salisbury District Hospital. Fortunately, Lee’s injury was less serious than first feared. He has suffered muscle damage in his neck but is otherwise ok. We are all relieved. The annual Dinner will be held on Friday 5th May at the Royal British Legion. Tickets will go on sale later this week. Please see Alan or Kim Rex.